Finally it seems like winter has set in. No complaint though. We had lovely summer hence do not mind the grey winter mornings and early nights. In fact sitting in my office overlooking the garden the rainy day seem very romantic. Keralan filter coffee in my hand. 30 mins respire from a work that most days leave me shattered -nature, coffee, this garden, romance with nature and my kitchen are my only breather. Thinking about my kitchen- kitchen!! Yes the space where I pour my love to create magic. Clichés right?! Actually not. To me food is a form of art that most people understands. I believe that every cook in every household is an artist in their own right. They add their own emotion, their own lotion potion, their own story, past, present and aspiration. Have you ever noticed how taste of same food varies from one hand to another? Amazing isn’t it! We add Love! My kitchen off late has become my ground for economic activity. Many of you, my blog followers, my friends and those of you who keep motivating me to go on, have started to order food from me. It’s been some time which I thought eventually will stop. But to my amazement, it is growing, I am growing. My kitchen is no longer just my kitchen! Now, it is part of your life too. I thank you all for taking the next step…For me, with me! Making me part of your life, giving me the opportunity to take my story to your dining table and stomach. Doesn’t they say, best way to one’s heart is through their stomach! Oh, I need to look at the clock! And I don’t want to as I know it will only remind me that my lunch is over. 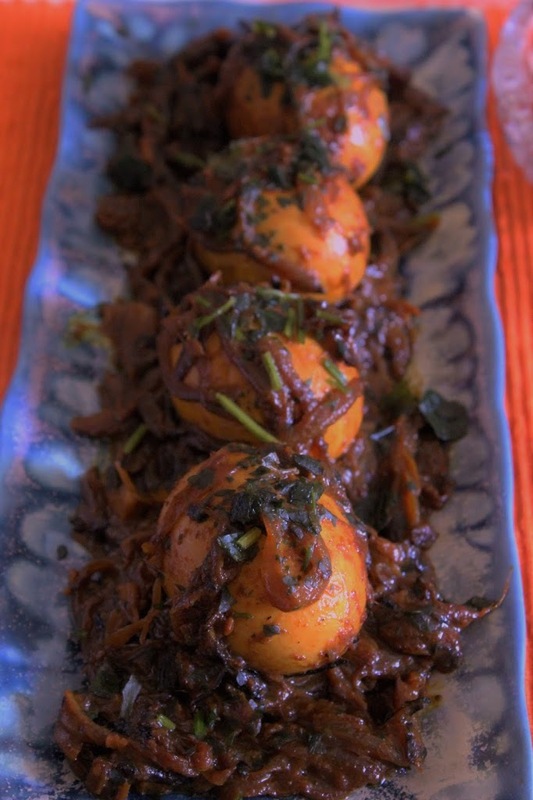 Here is a recipe for simple Dimer Do Piyaanja/ Anda Do Pyaza/ Bengali Egg Do Pyaza. I am very fond of egg. And a simple meal of rice and egg on a winter night is bliss. Today I am lazy and this one is for all those lazy souls. Cook it! 1. Boil the egg. Add a pinch of salt into the water. Boil for 10 minutes on a high flame. When done, peel the skin of the egg gently. 2. 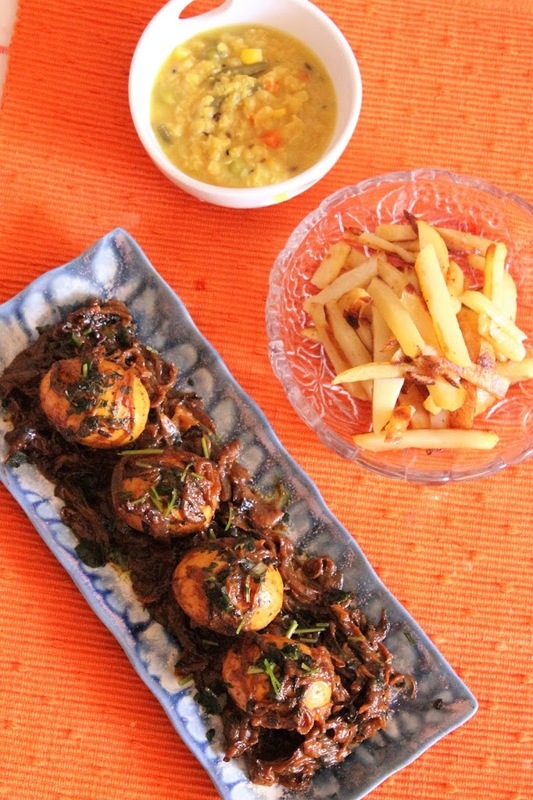 Marinate the boiled eggs with salt and turmeric powder. 3. In a pan put 1 tbsp of mustard oil. When the oil is heated slightly fry the boiled eggs and put them aside. 4. Add rest of the oil and heat. 5. Now add chopped onion and fry for a while on a medium heat. 6. Then add grated garlic and ginger paste and fry for another 3-4 minutes. 7. Add salt, turmeric powder, cumin powder and red chilli powder into water and make a paste. Add to the pan gravy and mix well. 8. 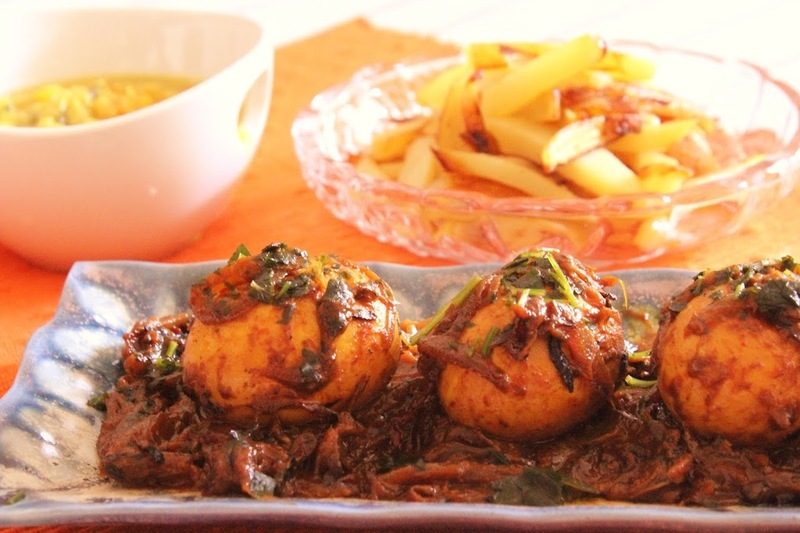 After all the spices are cooked, put the fried eggs into the gravy. 9. Add sliced onion and give a stir. 10. While the gravy is becoming dry, add 1/2 cup of water and cook until the gravy leaves oil. 11. When its done, add garam masala powder and sugar. Stir and cook for another 1-2 minutes.